I had to draft a letter for an association of which I am a committee member. Having drawn up what I thought was a suitable wording, I submitted it to the other members of the committee for their comments. I was rather surprised that two of them replied complaining about my use of the spellings organization and publicize. Please use English spellings of the words organisation and publicise. Since I was writing on behalf of the association, not in a personal capacity, I changed the spellings to please them. But they were wrong in thinking that the -ize spelling is not “English” (ie not BrE). What does “the dictionary” say? Here’s the great OED. -iseː a frequent spelling of -IZE, suffix forming vbs., which see. And it doesn’t even list “organisation” and the like alphabetically. You will find this word only under the z spelling. Let’s be clear: -ise is British only, but -ize is both British and American. And there are many British people, including me and the authors of the OED, who write -ize. Many years ago I submitted an article to JIPA, which has (or then had) a policy of encouraging British authors to use British spellings (colour, centre etc) and American authors to use American spellings (color, center etc). Fine. In the article I followed my usual habit of using the British (yes!) spellings velarized, nasalization and so on. JIPA’s copy editor, trying to be helpful, and mistakenly believing -ise to be the only British spelling, “corrected” many of these to -s-. Unfortunately, this being before the days of find-and-replace, he or she also missed many cases of -z-. The result was an inconsistent mess, and I had to insist that the spellings all be changed back to what I had written originally. Before I go, I’d like to draw to people’s attention an excellent Language Log posting about the pronunciation of Uyghur names, with sound clips. Because... this blog will now be suspended until 10 August. The Guardian has now turned its attention to Italian, with free phrasebooks every day this week. As with the Spanish series (blog, 8 July), each booklet contains one page devoted to pronunciation. And as with the Spanish series I want to complain: if you can’t say anything correct and useful, don’t say anything at all. Don’t get me wrong: most of the stuff in the phrasebooks is correct and useful. But not all of it. I would criticize two things in particular about the Italian pronunciation guide. What is the ordinary reader to make of this? If s/he can produce a trill, should s/he use it in Italian? Does “not so much” mean that the number of vibrations in an Italian [r] is lower than in a Spanish [r]? Or that articulations other than a trill are more prevalent than in Spanish? Or what? Both languages have the contrast between tap and trill in intervocalic position, e.g. Spanish pero vs. perro, Italian caro vs. carro. The only sense I can make of the statement in the phrasebook is the highly technical one that in initial position Spanish r is always trilled, whereas Italian r is quite often a tap [ɾ]. That fact (if it is one) does not really pass the test of usefulness. That claim does not pass the test of correctness. Anyone who remembers a little French from school knows that the Italian accent mark in this word is a grave accent, not an acute one. This sort of elementary error does not inspire confidence in the rest of the phrasebook. The uvular trill, [ʀ], is very rare among the world’s languages. However the languages that do have it include French, German, and Dutch — though in each case there are other speakers of the language, perhaps the majority, who use a uvular fricative (or something else) instead. 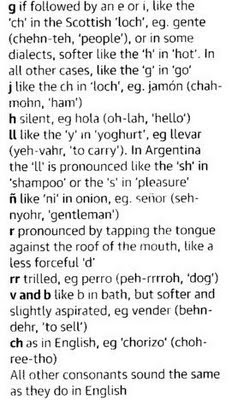 One thing I noticed in Paul Joyce’s German pronunciation pages was that the uvular trill is what he recommends for “consonantal r”. The German consonantal 'r' is described as a 'roll' or 'trill', by which we mean that the speech organs strike each other several times in quick succession in the articulation of this sound. In northern and central Germany, this sound is made towards the back of the vocal tract, with the back of the tongue raised towards the uvula in order to create a narrow passage. 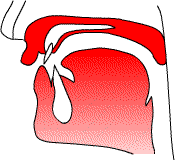 When the airstream moves through this passage, the friction thus created causes the tongue to touch the uvula either once (uvular flap) or several times (uvular roll). The 'r' sound thus created has a rasping throat-clearing quality which can be equated to a less extreme version of the sound produced when gargling. Although originally used in informal contexts, this [fricative] variant of consonantal 'r' is slowly emerging as the most common pronunciation of the sound in Germany. Furthermore, I think (am I right?) 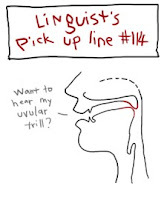 that most learners would find a uvular fricative easier to learn than a trill. Not so many people are aware that there are several nouns in θ and one in s that exhibit the same alternation, namely the change from a voiceless fricative to a voiced one before the plural ending is added. Thus we have mouth – mouths, truth – truths, house – houses. Hah! the spelling doesn’t show this. But it’s there in the pronunciation: maʊθ – maʊðz, truːθ – truːðz, haʊs – ˈhaʊzɪz. There are also plenty of nouns ending in a voiceless fricative that behave regularly: cliffs, graphs, coughs; faiths, deaths, osteopaths — and all the remaining nouns in s plus all of those in ʃ (buses, kisses, rushes, dashes). The list of those that switch voicing is closed: new coinages or borrowings behave regularly. The list of nouns in th that exhibit the alternation is quite short: baths, oaths, paths, sheaths, truths, wreaths, youths, and even with these there are some speakers who treat one or more of them regularly. You may still be able to listen to the programme here. It’s depressing that some writers of foreign language textbooks have so little knowledge of phonetics. They don’t know how to teach pronunciation (except by imitation). They don’t have the understanding to describe speech sounds. They don’t have the vocabulary to explain how sounds are made. So when they come to write textbooks they can’t give clear explanations of how to pronounce the language. The Guardian is publishing a series of Spanish phrasebooks this week. At the back there is a Pronunciation guide. Put yourself in the position of a naïve would-be learner of Spanish, and see how much help it offers. What kind of sound would you take a less forceful ‘d’ to be? A fricative, perhaps, or an approximant? Or a very lenis plosive with no voicing? No, that’s the description the booklet gives of the Spanish single r — which is actually a pretty forceful tap, [ɾ]. Fortunately there is a supporting audio CD available (at a price). But if the author devotes a page in the phrasebook to pronunciation it ought to give accurate and helpful advice. If you have even a very elementary knowledge of Spanish phonetics, you’ll know that the voiced plosives /b d g/ have weakened allophones [β ð ɣ] intervocalically and finally. The Guardian booklet tells us nothing about this for the dental and velar. You’d think it would at least have mentioned that the d in nada sounds much more like the th (ð) in English father than it does like English d. I would have thought this more important than telling us about Argentinian variants of ll. Q: If the plosive-fricative alternation in /d/ and /g/ is not worth mentioning, why does the author mention it for /b/? A: Because that’s where the spelling forces it on everyone’s attention. But what does he say? that v and b are “like b in bath, but softer and slightly aspirated”. Oh dear, oh dear. Here we have a phonetic technical term, aspirated. It’s just that the author doesn’t understand its meaning. For the record, no plosives in Spanish are aspirated (= with an interval of voicelessness between the plosive release and the following segment). I suppose I could defend the position by saying it was a non-technical usage (consonant with the rest of the guide), but on the other hand I'd certainly avoid it if I was doing the guide again. Let me try to explain the facts as I understand them in terms that the ordinary reader might be able to understand. In Castilian Spanish, the letters b and v refer to the same sound. At the beginning of a phrase or after m or n this sound is just like an English b. (So vaso sounds like “BAH-so”, and enviar is “em-bee-AHR”.) Elsewhere it is pronounced like an English v, except that you use the two lips rather than the lower lip and the upper teeth. Initially or after a nasal /b d g/ are plosives, [b d ɡ]. Elsewhere they are realized as fricatives, [β ð ɣ] (or the corresponding approximants). Contrary to the impression you may have formed from the above, I cannot actually speak Spanish, because I have never learnt it. But I certainly know how to pronounce it. And I know how to teach other people how to pronounce it. Oughtn’t this to be part of the intellectual equipment of all teachers of Spanish? What is the AmE pron of rowlock? In a sense there isn’t one, because the Americans call the object in question an oarlock. In BrE, where we do use the word rowlock, those who are familiar with rowing and oarsmanship call it a ˈrɒlək (or possibly ˈrʌlək). Those who are not may instead use a spelling pronunciation ˈrəʊlɒk (compare forehead, where the spelling pronunciation has largely displaced the traditional ˈfɒrɪd). In LPD I proceeded on the assumption that any American rowers who actually needed to use the British term would use a BrE-style pronunciation. In a trivial way, the same sort of question arises if we ask what the BrE pronunciation of rowboat is. In a sense there isn’t one, because in BrE it is called a rowing boat. But we have to draw a line somewhere: no one wants to say that in AmE trousers is pronounced pænts. 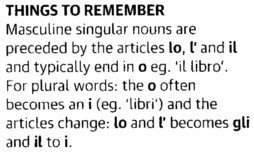 David Marsh, the Guardian style guide editor (and, I’m proud to say, my former student), had a nice piece in the paper a few days ago about umlauts. 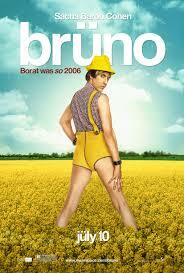 Sacha Baron Cohen’s latest avatar, after Ali G and Borat, is called Brüno (sic). Although he is supposedly Austrian, and therefore German-speaking, spelling this name with ü is linguistically entirely un-German. "There is absolutely no precedent for the name Bruno to be written with an umlaut, and to do so contravenes a general rule of German phonetics"
The two dots above the vowel letter here are purely decorative. David refers us to the entertaining Wikipedia article on metal umlaut. This article lists a whole lot of rock bands and the like that have ornamented their names in the same way: Mötley Crüe, Motörhead, Maxïmo Park and many others. There’s also the American punk rock band Hüsker Dü, whose name comes from the Danish/Norwegian phrase “do you remember?”, correctly written Husker Du? (but that way it wouldn’t look so excitinɡ). But why would Brüno want to project a heavy metal image? That’s not the sort of character he is at all. Confüsing. It must have seemed like a good idea at the time. When the Russian energy giant Gazprom set up a joint venture with a Nigerian company to develop natural gas resources in Nigeria, they chose a name that from the point of view of Russian seems obvious and unexceptionable: Nigaz, i.e. Nigeria + Gaz. They would have expected to pronounce it in Russian as ˈnʲiɡas, -ɡəs and in English as ˈnaɪɡæz. As commentators pointed out, it seems unlikely that an English speaker was in the room when they chose it — even though all educated Nigerians speak English. Because the natural way to read this spelling in English is as ˈnɪɡəz, just like niggers. And that is not a respectful way for the Russians to refer to their African partners. ‘Nigaz’ is yet to feature on Gazprom’s website, which does confirm the formation of its partnership with NNPC but interestingly, offers no name for the new enterprise. I blame the ambiguity of the English spelling system, where the letter i can often arbitrarily stand for aɪ or ɪ. Just like in the word(s) wind. As we grow older our teeth and gums deteriorate. When I was young I used to be able to make labiodental plosives, [p̪ b̪] — but I can’t now. I can no longer get a hermetic seal between my lower lip and upper teeth: there’s always some escape of air through the gaps between my teeth. This is no doubt one of the reasons that no language has distinctive labiodental stops. It means that when I try to make [ɱ], as in information or emphasis, I end up with some sort of [ṽ]. Inevitably some air escapes through the mouth. What this is leading up to is that I used to think that I would usually pronounce seventy as [ˈseɱnti] (with the alveolar nasal somewhat dubious). I am sure plenty of other people still do. But what I now say is [ˈseṽnti]. And that must have been an intermediate stage in my previous nasal-assimilated pronunciation. Underlyingly it’s still ˈsevənti, and always has been. As promised in response to yesterday’s comments, here’s how I would teach the sound [ɬ], the Welsh ll as in Pontcysyllte. This consonant is a voiceless alveolar lateral fricative. To make it you have to control the voicing (voiceless), the place of articulation (alveolar) and the manner of articulation (lateral fricative). I would teach each of these features separately, and then combine them. To get awareness of voicing, pronounce [fvfvfv θðθðθð szszsz ʃʒʃʒʃʒ] and then [mm̥mm̥mm̥ nn̥nn̥nn̥ ll̥ll̥ll̥]. As you do so, check the voicing by covering your ears with your hands or by feeling the front of the larynx with your fingers. As you alternate between voiced and voiceless make sure that everything in the mouth remains unchanged: the only difference should be at the larynx. Concentrate now on [ll̥ll̥ll̥]. Alveolar place should not be a problem, for native speakers of English at any rate. Your remaining task is to change the sound from a lateral approximant to a lateral fricative. This means that you have to narrow the gap between the side rims of the tongue and the side teeth. Try to do this while saying a long [l̥]. It should change into [ɬ]. Feel the air escaping turbulently over the side of the tongue. Keeping everything else constant, change from breathing out to breathing in. Check that you can feel a cold airstream at the side (not in the centre line). Go back to breathing out. Lastly, we need to check the place of articulation. If you have carried out the above steps successfully, the place of articulation is still alveolar. The ll sound is a single phonetic segment, and should not have any accompanying elements. There should be no element of velar friction before, during, or after the lateral fricative. There should be no central friction (s or θ) before, during or after it. The pronunciations [xɬ, θɬ], often used by non-Welsh speakers, are not acceptable. Try the words llaw (hand), lle (place), llo (calf), llwybr (path). Then try pell (far), twll (hole). Then allan (out), and felly (thus). Like the other Welsh voiceless consonants, [ɬ] is considerably longer intervocalically than would be the case in English: but there is no change in quality. Make sure that you can hear and make the difference between dallu (to blind) and dathlu (to celebrate). If you use [ɬ] in place of English [s], you can produce a common type of lisp (lateral sigmatism). Try [ɬɪkɬ piːɬɪɮ] (six pieces). You are now equipped to pronounce not only Welsh but also Icelandic and Zulu words with this sound. Icelandic has a voiceless lateral affricate. Try fjall [fjatɬ] (mountain), Þingvellir [ˈθɪŋɡvetɬɪr] (the site of Iceland’s first parliament). Zulu has voiceless and voiced alveolar lateral fricatives. Use your control of voicing to switch between them: [ɬɮɬɮɬɮ]. 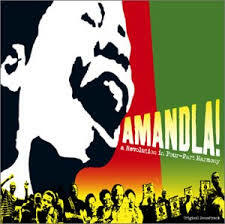 Then try -hlala [ˈɬaːla] (sit) and -dla [ɮa] (eat), not to mention amandla [aˈmaːndɮa] (power). Lastly, do not fall foul of the “exotic sounds syndrome”. For speakers of languages that have it, [ɬ] is a perfectly ordinary sound that does not require any special effort. You, too, must use it effortlessly.